1999 - Alan Jackson, red roan Trakehner colt by Aalen. Owned by Natasha Powers/Powers Farm, FL. 2000 - Hacienda, chestnut roan Trakehner filly by Aalen. Owned by Linda Ransom/Trumpet Farm. 2001 - Pretty Poetry, red dun American Warmblood filly by Charm Offensive. Owned by Natasha Powers/Powers Farm, FL. 2002 - Hysarra, red roan Trakehner filly by Aalen. Owned by Kat Bryant/TMS Stables. 2003 - Hector, chestnut Trakehner gelding by Satellit. Owned by Curtis Sayers/Oak Tree Equestrian. 2006 - Halogen, chestnut sabino Trakehner colt by Aalen. Owned by Alethea Drexler/Shady Grove Ranch. 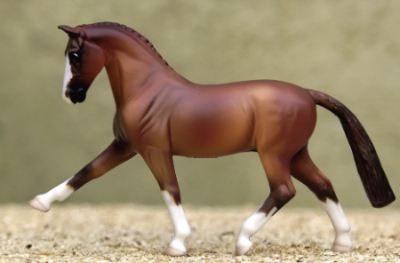 2010 - Mariarti, chestnut Dutch Warmblood colt by Monte Christo. Bred by Caballos Del Mar/PurpleSunshineStable. Owned by Marina Amanova/PurpleSunshineStable. 2012 - OTE HighFlyer, chestnut Trakehner filly by Hitched. Owned by Curtis Sayers/Oak Tree Equestrian. 2013 - Hokku, chestnut Trakehner filly by Hitched. Owned by Kay Myers/Caballos Del Mar.